It was October 1st 2008 and it was opening day of the bow season for Bull Moose. My brother and I were pretty excited to try out our new Excaliber crossbows that we had just purchased earlier in the year. We had practiced all summer with them so we were confident that we were ready. 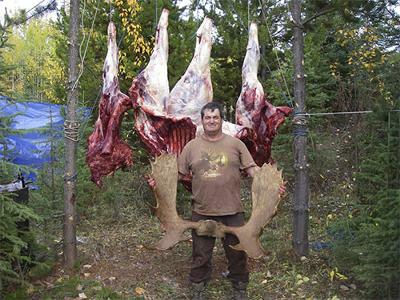 We have hunted moose with rifles for over 30 years, road hunting and calling. We have called in our fair share of moose so all we had to do was to get one to come in close enough, 50 yards or less and it would give us a good opportunity. It was now the morning of October 4th when we arrived at the timberline location where we were going to set up and start calling. It was a cold frosty morning with no wind, perfect for moose calling. We grabbed our crossbows and range finders and headed up an old logging road where we were going to set up by a moose trail where we had seen two cows earlier in the week. I had been calling for about 1/2 hour when deep in the timberline I heard a grunt. I turned to my brother and signaled to him that I’d just heard a moose reply and pointed to the direction where he was coming from. I called again and the bull replied again, I called once more and nothing. I waited for about ten or so minutes and called again...this time he grunted back but he was much closer than before. I called once more, he answered and I knew he was on the move coming towards us in a fast trot, grunting steady and breaking everything in his path. My heart was pounding and I knew my brother’s was as well. We had to get ourselves set as he was coming right at us. We had already used our range finders so we knew how close I needed to call him to ensure a good shot. Suddenly, I could see his antlers above the smaller trees coming right towards us. When he broke from the trees we could see the steam coming from his mouth...he was now 30 yards away from where we were sitting. He stopped and turned broadside as if he knew not to go into the small clearing where we had set up but it was too late. I heard my brother’s arrow release and I released mine seconds later both arrows struck behind the shoulder. The moose bolted as we watched with amazement as he went about 40 yards and collapsed...it was over, we had just bagged our first bull moose with a crossbow! My arrow had gone into his lungs and proved to be the fatal shot. 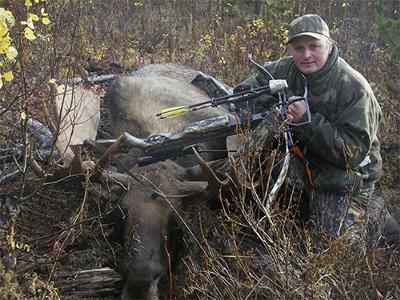 It was our first moose with a crossbow and I must say it was one of the best hunts I have ever been on and one of the most memorable. Loved that story! Thanks man.